The Resort is located on the tranquil beach of Candidasa, on the eastern coast of Bali, approximately 70 km, or about one and half hours drive from the airport. Ideally situated away from the crowds, at the most peaceful beach, surrounded by natural serenity, bush, mountains, ricefields and ocean, you may enjoy a relaxing and romantic atmosphere. Surrounded by tropical gardens, the tastefully decorated deluxe bungalows and unit are complete equipment, ideally situated away from the crowds, at the most peaceful beach, offering the majesty of nature with unique panoramas - you will find at Rama Hotel Candidasa. 74 well appointed air-conditioned bungalow and wing-rooms, artistically furnished and decorated with typical Balinese Architecture. Provided with private bath and shower, cold and hot running water, hairdryer, mini bar, IDD phone, music, private balcony and satellite TV. The new wing has scales and a second phone in the bathroom. Activity - lover will enjoy mountain trekking and watersports. 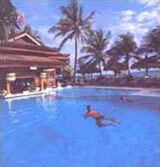 Swimmers may choose between the blue waters of Candidasa beach or the relaxing pool, with swim up bar. The two restaurant prepare all kind of delicious cuisine, such as Chinese, European, Fresh Seafood, Pizzas will served by friendly staff in beautiful surroundings which will ensure you will have a fantastic holiday at the Hotel Rama Candidasa. Cozy swimming pool, day-night tennis court, 2 restaurants, 2 bars, shop & boutique, children playground, largest private white sands beach-terrace above the sea - No trespassers, No molesting sellers - SPA service, laundry service and baby sitting service.